Without competition, the form and structure of many sports would disappear. Think of all the elements of hockey you’d be missing out on if you never competed. You’d never learn to check, your stick handling skills would remain untested, and your shots unblocked. Without any worthy adversaries, you’d forever be unable to master your full range of options in a sport centered around direct competition. This dynamic changes when applied to a sport like parkour. The entire practice of parkour revolves around the dialogue of you versus your environment. Any and all components of parkour are performed individually. None of these skills require, or can even utilize, direct competition against other practitioners. The execution of competition has certainly been an odd fit in the world of parkour, but it’s been gaining popularity through the efforts of the hardworking organizers of these events. In the case of freerunning competitions, the emphasis on individuality has been a constant source of controversy in regards to judging a collective medley of styles. Speed competitions on the other hand are more clear-cut. They typically offer numerous options to tackle the course, but ultimately reward the quickest runs. Both formats have faced slight revisions over the years from their original implementation. Let’s take a closer look at several of the major competition platforms and how they handled their events. Use the timeline at the bottom to help keep track. The typical format of freerunning competitions, as we know it today, all started in Vienna, Austria with Red Bull’s first Art Of Motion. The stage was nestled in a corner of a vacant city plaza. Props were rolled out and spread amongst the small concrete buildings bordering the vicinity. Scaffolding sets topped off with plywood platforms, a volunteered automobile, and the trailer for a small semi all joined the fray. Heavy crash mats, strategically placed beneath the biggest drops, allowed athletes to go crazy without too much risk. Despite this, the first Art Of Motion played host to Red Bull athlete Ryan Doyle’s legendary leg break. Doyle had the highest score of the night when his final run rolled around; the last run of the night. With the knowledge that he had already placed first, Doyle decided to end his run with a bang. Throwing a double cork, the predetermined champion tragically missed the mats, snapping his lower leg in half. While Doyle eventually made a full recovery and went on to win the 2011 Art Of Motion in Sao Paulo, he was absent for the event’s second showing. Skipping 2008, the Art Of Motion emerged once more in Vienna for 2009. This time, the Vienna Arena was rented out, which enabled multi-tiered battleground of platforms to descend from. Although the crash mats were removed—a change which remained constant throughout future iterations—the tricks thrown were heavier than ever. From Delyan ‘Dido’ Dimitrov’s double side flip down a two-story drop, which earned him the “Best Trick” award, to the first place Paul ‘Blue’ Joseph’s wildly massive jumps, a higher standard was set for future competitions. Difficulty: How much skill it takes to complete the attempted movements. Execution: How well the athletes performed their attempted movements. Creativity: Were unique or rare skills utilized? Did the athlete take an unexpected route? Flow: The fluidity with which athletes chained their movements together. Points are allocated to each area following an athlete’s run; a run which athletes are given up to 90 seconds to perform.. The athletes with the highest sum total move onto the final round where the process is repeated once more. Athletes are granted up to sixty seconds to display their skills. Moving on, 2009 featured one more competition in Helsingborg, Sweden. Red Bull went all out in the next two years, packing them with eight competitions. Three took place across the USA, and the others spanned Japan, Brazil, Great Britain, Greece,a return to Austria, and even one in Kuwait. The event in Kuwait was held on the abandoned Failaka Island. This Art Of Motion really shook up the formula by taking place across the entirety of the war torn land. Instead of individual runs, the competitors were grouped off into five teams of four athletes, and given 36 hours to produce the slickest edit possible. Afterwards, the athletes gathered in a cinema to vote for the best video. While Art Of Motion Kuwait’s video competition proved incredibly popular, it has only been partially replicated by MTV’s Ultimate Parkour Challenge. Speaking of putting a unique spin on a now traditional event, the two Red Bull competitions of 2012 brought some novel features along with them. The first saw a return to Sweden, with Helsingborg pushed to the wayside this time in favor of the Verzasca River in Lavertezzo. Slick combos ensued over massive rock formations breaking the flow of the river. No man-made structures were required for the event’s success, just freerunners and nature. The second event of 2012 marked the second gathering in Santorini, Greece. Less invitations were sent out for a competing spot and a video competition was put in its place. Prospective athletes were required to send in a video submission, no more than 90 seconds in length, and cross their fingers in hopes of being chosen. Future forays into Santorini have since been precluded by these video competitions in a tradition which stirs up almost as much hype as the main event itself. Santorini 2013 brought the heat with a preliminary qualifier preceding the main competition. Set on a different part of the island, the now conventional preliminaries mimicked the typical style of freerunning competitions. Those who placed in the top six spots got to compete on the main stage. Because of the prestige and stiff competition that goes hand-in-hand with Art Of Motions in Santorini, past preliminaries have drawn hordes of frighteningly talented international athletes. Santorini has been the sole location for the Red Bull Art Of Motion since 2012, with one event taking place per year. Since the advent of the video competition and on-site qualifiers, Red Bull no longer invites athletes to compete. The roster of 18 is instead composed of the six finalists from the previous year, the six winners of the video competition, and the top six spots in the qualifiers. With the 2015 on-site qualifier drawing in over eighty hopeful participants, the annual Red Bull Art Of Motion in Santorini has since become the most famous and celebrated of freerunning competitions. Several athletes have found their professional careers launched to new heights from a Red Bull sponsorship after consistent success in the Art Of Motion. 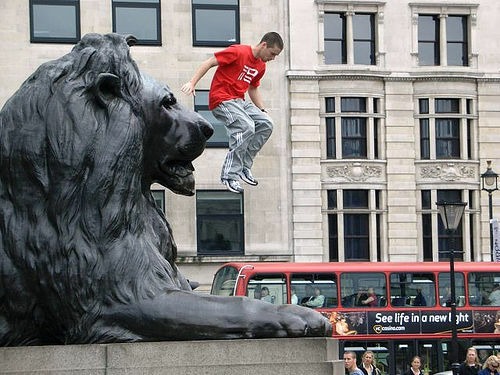 Ryan Doyle became a sponsored athlete after winning the first major parkour competition ever in 2007. He’s currently set to star in the upcoming sci-fi flick DxM. Jason Paul and Pavel ‘Pasha’ Petkuns of Team Farang fame earned their Red Bull sponsorships after nabbing three Art Of Motion titles each. Dimitrius ‘DK’ Kyrsandis was informed of his acceptance as a Red Bull athlete at the onset of the Santorini 2015 comp. With a dark horse victory in Santorini a year before, DK went on to make Red Bull even prouder by claiming first in 2015 as well. While Red Bull took the year of 2008 to regain its bearings, Barclaycard launched into the interim with flourish. Organized by Urban Freeflow and set in the Roundhouse in Camden, the 2008 Barclaycard comp arranged a grander stage than in Vienna, as well as a more robust lineup of 23 athletes. A kingdom of black boxes, each adorned with the Barclaycard logo, gave athletes an epic two-story descent to ground level. Crash mats were distributed around strategic locations which gave Pip ‘Piptrix’ Andersen the perfect opportunity to throw his showstopping gainer double full-twist. Urban Freeflow and Barclaycard collaborated once more in 2009 to bring back the World Freerun Championships, this time to Trafalgar Square. The 2009 comp boasted 25 athletes, with Urban Freeflow’s sponsored, international athletes once more forming the brunt of the lineup. The stage layout was heartily reminiscent of the previous year, yet modified in key areas. For instance, in an act of tribute to Vienna’s 2009 Art Of Motion earlier that year, all crash mats were removed and the height of each platform was decreased to compensate. The 2009 World Freerun Championship was the most visible competition to mainstream audiences at the time. BBC Three even broadcast the final runs on live television. Despite the resounding success of the event, there have since been no others hosted by Barclaycard. A subsequent event was rumored for autumn 2010, but plans apparently never left the drawing board. Looking to cash in on the freerunning craze spurred on by Red Bull and Barclaycard, MTV assembled an all-star cast of World Parkour And Freerunning Federation athletes for the first ever parkour-based television series. The pilot episode aired in October 2009 and was met with mixed reviews from the parkour community. Much of the hesitation was due to injuries sustained by Daniel Arroyo and King David on set. The main series aired in May 2010 and received a warmer reception. The show boasted three competition styles per episode. Each began with the athletes splitting into teams of three to produce a parkour video around the episodes’ given location in Los Angeles. The videos were then judged according to the usual denominators: Difficulty, creativity, flow, execution, and raw entertainment value. The winning team moved onto a freerunning round by default—judged according to Red Bull’s preset standards—and the losing team members competed against each other in a speed course. The competitor with the fastest time got to join the winning team in the freerunning round. 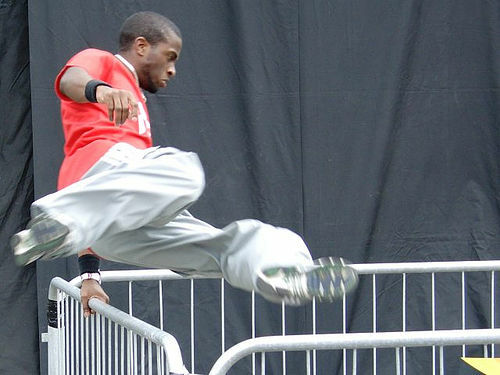 MTV’s Ultimate Parkour Challenge was the first to boast both team-oriented challenges and video competitions. Its insistence on covering all aspects of parkour and freerunning gave an advantage to the more well-rounded athletes as opposed to those solely specialized in just efficient or flip-based movement. This fusion of movement styles in parkour competitions once more found its way to broader audiences with Jump City: Seattle. Airing in February 2011, Jump City: Seattle tinkered with the previous show’s foundation. Eschewing free-for-alls amongst several individuals, the show featured four freerunning teams of four athletes. Three of the teams were already well-established on the parkour scene with The Tribe of American Parkour, Tempest Freerunning Academy’s Pro-Team, and Miami Freerunning. The fourth team was crafted specifically for the show. The show was divided into a speed round, and then a freerunning round, with two teams competing each episode. Three members from each team squared off in each round. The team with the lowest accumulated time on the speed round, added up between each member’s run, would win that round. Likewise, the team with the highest sum of freerunning scores would be declared the winner. In the event of a tie, each team would send out one athlete to eek out one last run in the freerunning round as a tie breaker. While the team-based scoring method was, and still is, rather novel, it added little to the actual proceedings of the competitions. 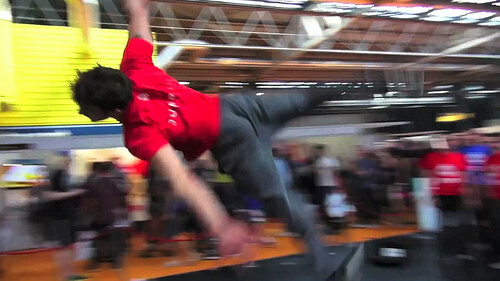 The freerunning round still played to the same beat as Red Bull competitions of the past. However, the speed rounds set a precedent for later parkour competitions in the form of checkpoints, or in this case “fly zones”. Rather than pushing athletes through a linear course a la Ultimate Parkour Challenge, these speed rounds were more open-ended. Athletes were required to pass through “fly zones” dotted about the area, albeit in any order they desired. In this way, Jump City: Seattle added a layer of strategy and interpretation to the design of speed comps. From 2010-2011, Red Bull dominated the competition scene. Its stronghold as the sole authority had gone unchecked since Barclaycard, with only MTV’s Ultimate Parkour Challenge and Jump City: Seattle sliding in to give enthusiasts an alternative. Now, enter Philip Ljungberg and Marcus Gustaffson, Air Wipp Academy’s CEO’s. These two Art Of Motion veterans had previously scouted the location, and organized the athlete lineup, for Red Bull’s 2009 competition in Air Wipp’s hometown of Helsingborg. After Red Bull declined to hold another event in Helsingborg, Ljungberg and Gustaffson set out to do it themselves. The location for the 2012-2013 Air Wipp Challenges remained unchanged from 2009; the forebuilding to a grand castle at Helsingborg Arena. The cost of building fees, airfare for athletes, food, accommodation, and other goodies was too heavy for out-of-pocket payments by Air Wipp. Luckily their sponsor, Betsafe, stepped in to lend a hand. The competition in 2012 went off without a hitch, replete with an audience to rival the masses that Red Bull reeled in on the reg. For 2013, the Air Wipp CEO’s attempted to one-up themselves. Unfortunately, there was one factor beyond their control. After reprimanding a tardy construction crew, and working around the clock to make up for lost time, the 2013 Air Wipp Challenge was primed for success. Yet the forecast said otherwise as a downpour drenched the whole setup just hours before go-time. Improvisation was key as towels were used to dry off the course at the rain’s end. Since the majority of the setup was still too damp, and thus unsafe for the athletes, the course size was reduced to a single, central string of platforms. The rules were changed ever so slightly. The designated starting point of each run was on the top platform, and they were to end up on the bottom stage next to the audience. Instead of a qualifier and finals round, each athlete had two runs, and only their highest scoring run counted towards their overall score. The 2013 Air Wipp Challenge didn’t let the overcast conditions deter it from shining success. Lessons were learned however, with the 2015 Air Wipp Challenge taking place inside, rather than outside, Helsingborg Arena. The athlete lineup consisted of invited athletes, winners from a video competition, and the winners from on-site qualifier before the main comp. Air Wipp pulled out all stops for the event which boasted crazy lighting, fog effects, flame chutes, and charismatic presenting done by its own CEO’s. Krap—a clothing brand representing freestyle sports like parkour, skateboarding, snowboarding, and biking—organized parkour and freerunning competitions in 2013 and 2014. The competitions were part of The JamBo; an annual festival in Italy which celebrates these very ‘freestyle sports’. 2013 and 2014 played host to a freerunning competition in the vein of Red Bull, and a speed competition. Aside from the insane lines casually slung about in the freerunning round, the most notable innovation of these competitions came from the speed comps. In 2013, the competitors had to hit checkpoints in a sequential order which followed a U-shaped pattern around the obstacles used for the freerunning comp. This was similar to the “fly zones” in the Jump City: Seattle speed courses, creating multiple ways to tackle the course. The JamBO’s speed comp actually encompassed two rounds. The second round followed the same principles as the first, except that the course was run in the opposite direction. Rankings were allocated via lowest accumulated time. The 2014 speed comp dropped it’s already unique format in favor of tense one-on-one gauntlet style runs. The route was linear this time and favored pure athleticism over frantic ingenuity. Starting from a dead-hang on a scaffolding set, athletes would then drop on cue to a lower platform, swing beneath it, run up and across some massive shipping containers, vault some boxes, and then climb up and down one last storage container for good measure. The competition was a knockout-style tournament which has yet to be imitated on such a large scale. The North American Parkour Championships are an annual parkour and freerunning competition held by Origins Parkour at its gym facility in Vancouver. The gym’s scrappy owners had formulated one of the most original takes on the competition genre to date. With the stated goal to “set the foundation for the development of Sport Parkour Championships”, the NAPC has proven to be jam packed with fresh ideas. For the 2013 and 2014 invitationals, there were two speed rounds, two skills tests, and a two-on-two freestyle tourney. The speed rounds were similar to the 2013 JamBO, featuring multiple tags for athletes to hit while traversing obstacles. The skills tests also stuck true to the fluid nature of the sport by offering chances for variation. For the double barrier challenge, athletes were tasked with clearing two barricades spaced apart from each other. The primary judging factors were based on difficulty and execution. Techniques that required the least amount of contact over the vault boxes, such as flipping over them, garnered higher scores. The strides challenge held the same judging criteria as the double barrier. Athletes were tasked with moving from point A to point B in as few steps as possible. If the top scoring athletes were tied in the amount of steps they took, the judges would then look at the difficulty and execution of their runs. In addition to creating new challenges which fit perfectly within the realm of parkour, Origins Parkour diced up the recipe for freerunning competitions as well. A two-on-two freestyle tourney sounds unworkable at first, but the end result was indelibly satisfying. For each round, team members would execute a single run, and the team with the overall best runs would progress in a tournament-style bracket. Unlike Red Bull comps, which give athletes upwards of 90 seconds per run, athletes were only allowed to execute a single, continuous combo. 2015’s NAPC followed the template from previous years with the exception of the freestyle rounds. This time, Origins Parkour streamlined the process so that each person participated individually and was given two tries. The new method mandated that athletes’ runs included a string of obstacles. They had to traverse the first vault box, use the slanted wall for a trick, cross over a large box, and then seal the deal with some flair on the bar set. Despite the predetermined route, this format still allowed for a wealth of options while keeping each line curt and to the point. So far, a quintessential, “official” style of parkour and freerunning competition has yet to be formalized. Just as parkour itself has a visceral, ever-changing spirit to it, so too do the constructs which attempt to pit practitioners of this artistic sport against one another. 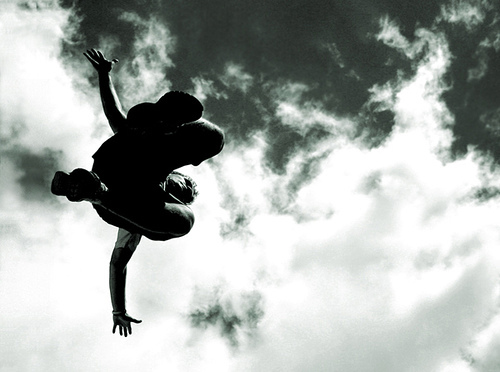 Despite Red Bull’s reliable foundation for freerunning competitions—utilized in turn by Air Wipp, Krap, and many smaller venues— there exist many possibilities for deviation as proven by Origins Parkour. Even a competition of speed covers certain variables liable to be shuffled about such as course length, orientation of checkpoints, or the number of competitors at any one time. With the rise of the competition scene finding new enthusiasts, smaller groups worldwide are taking up the mantle in their local communities. As parkour academies and large-scale meetups host yearly competitions, their presence has gradually enmeshed itself within the cultural fabric of the sport. Some may stick to the tried and true, while others may do some tinkering of their own. Either way, one thing is clear. The growth of competitions in parkour is still an unfinished story. This entry was posted in Land Sports, Parkour and tagged Competition, Freerunning, Parkour. Bookmark the permalink.